Beverly's Official Blog | News and findings from world of crafts, scrapbooking and more: New Giveaway! 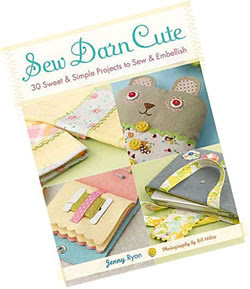 This month Beverly Fabrics has Sew Darn Cute by Jenny Ryan on sale for $16.97. But for you, we've got a FREE signed copy. Just leave a comment and we'll have a random drawing tomorrow. Easy, right? OHHH I love giveaways....too fun! Love that book! I cannot wait to see some projects made from it! I think that the book is a good one for me to have. Sew happy that the blog is back!!! what a cute project! i think i'd love the book! Super easy, and how cute is that book?! I hope I'm in time for the drawing! What a great book! Cute! I'd love to be entered in the drawing! Check back tomorrow for a "Weekend Challenge"! we could use that book at the nursing home for our arts and crafts activities. congrats to whoever gets it!